Children were part of the ceremony (and are part of fraternity life). Five member of the region’s first Youth/Young Adult formation group were professed into the Secular Franciscan Order as part of Holy Family Fraternity’s rite of profession, held June 2 at Church of the Holy Family, Vernon, NY. -- Mary Ann Baker, SFO. -- Pat Brophy, SFO (temporary one-year profession). -- Megan Breen, SFO, whose husband, Rob, organized the youth/young adult group. -- Christy Huynh, SFO, assistant director of student advisement at SUNY Oswego. -- Christy’s husband, Mike Huynh, SFO, director of campus ministry at SUNY Oswego. -- Beth Portuese, SFO, who just received her master’s in environmental science. -- Beth’s husband, Tom Portuese, SFO, MD, who just graduated from SUNY Upstate Medical College. Two friars from St. Francis Friary in Syracuse participated. Fr. 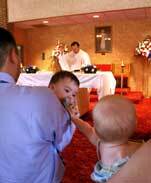 John Ruffo, OFM Conv., celebrated the profession mass, and Bro. Peter Cowans, OFM Conv., gave the message. Fraternity Minister Delores Faulkner, SFO, presided. With Fr. John Ruffo, OFM Conv. (l) and Bro. Peter Cowans, OFM Conv., flanking them, the newly professed are all smiles. 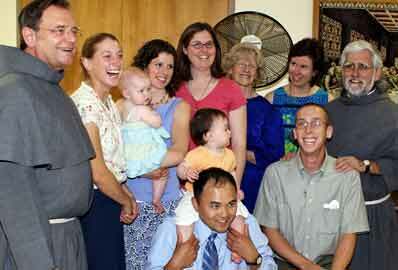 In the front kneeling are Mike Huynh (holding tot) and Tom Portuese, MD. From left in the rear are: Beth Portuese, Megan Breen (holding infant), Christy Huynh, Mary Ann Baker, and Pat Brophy.